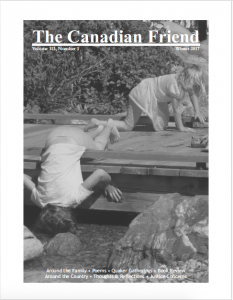 The Canadian Friend is the magazine of Canadian Yearly Meeting and is currently published three times a year to further the work and witness of the Religious Society of Friends in Canada. It is sent by group subscription to all interested members and regular attenders of affiliated Quakers Meetings in Canada. To purchase individual subscriptions ($20 in Canada; $30 Canadian funds to U.S., and $40 Canadian funds to all other countries), be added to the group subscription, or to change your address contact the Canadian Yearly Meeting Office. Subscribers should receive the next issue at the beginning of April 2019. The due date for the upcoming Summer issue will be May 6, 2019. The due date for the Autumn issue is September 30. Submissions on almost any topic of potential interest to Canadian Quakers are always welcome. Send submissions and inquiries to The Canadian Friend‘s editor. For enquiries concerning advertising and ad rates, contact the editor.